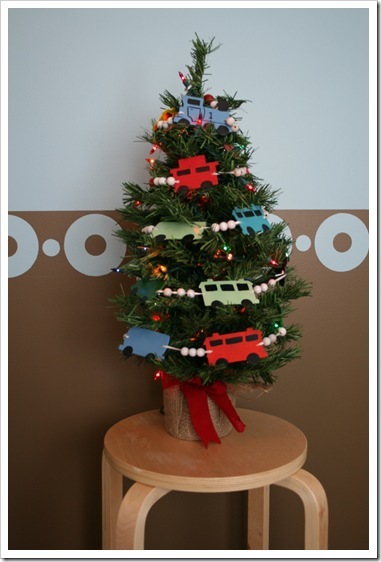 Oh Choo Choo Tree, Oh Choo Choo Tree&hellip;. 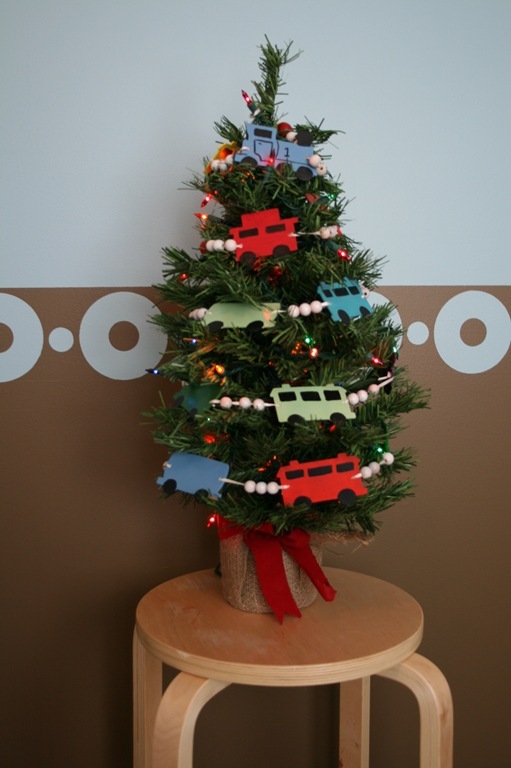 Oh Choo Choo Tree, Oh Choo Choo Tree…. 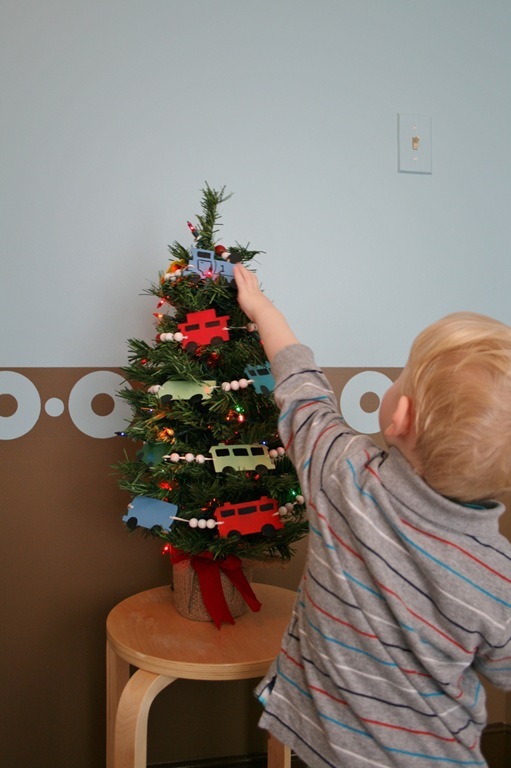 It was decided pretty early on that the Little Guy’s Christmas tree would have a train theme. There is not a day that goes by that when asked what he did all day, he does not answer, “played trains!” I was sure we would find some kind of cute garland with trains to wrap around a tabletop tree, place it in his room and call it a day. I love decorating for the holidays, but when it gets even just a little too involved I am “over it” pretty quickly. But after searching through several local craft and home dec shops we were surprised to come up empty-handed. 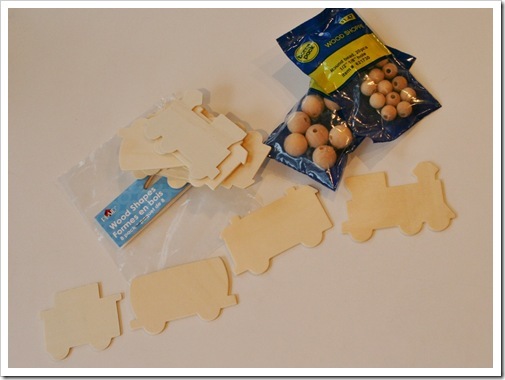 8 piece bags of little wooden train silhouette cut-outs for about $2.00 each. Each bag contained two sets of an engine, passenger car, tanker car and caboose. Coupled with two different sizes of wooden beads I figured we were in the garland business. 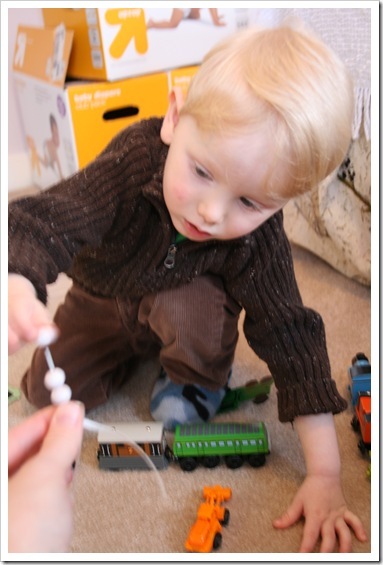 The process to a kiddie style winter wonderland started with drilling tiny holes in the ends of each train and adding two coats of primer. 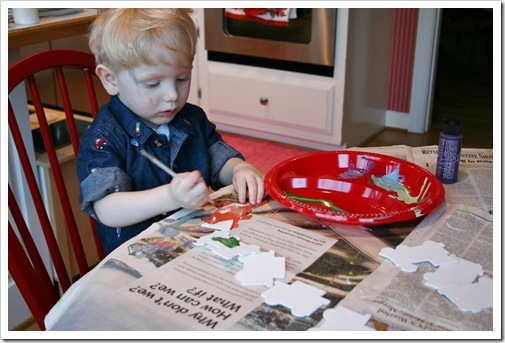 Next, I let the Little Guy have at it with the acrylic paints. He picked the colors, started the job and then I finished them up to make them even. I also spray painted the small wooden beads white and the larger beads deep red. BTW- That’s right, he does have green paint smeared across his face and into his nearly white hair. It took two days of washing and combing before he no longer looked like a little punk rocker. After several base coats and some details added with a black paint pen we started the layout for stringing our garland. 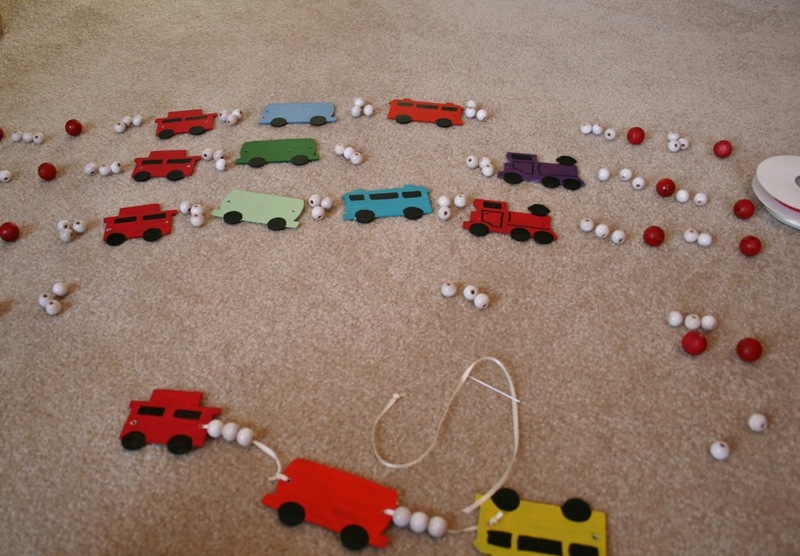 Again, the little engineer picked which colors went on each train and then we divided the small and large beads between each line of trains. 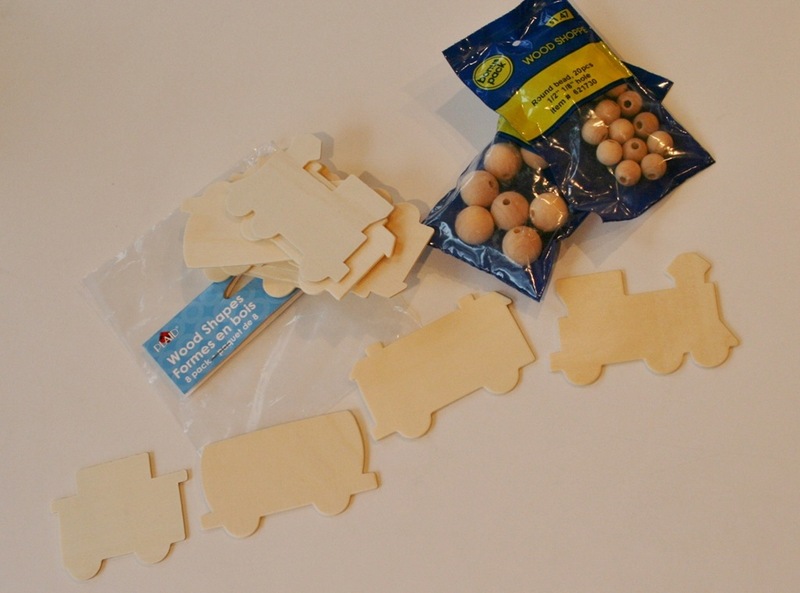 Then using skinny creamy white ribbon we started stringing the lines together beginning with the train sections. I did have to go back and recut the holes I had drilled using a small hole punch because the paint had closed them up. Then I simply tied knots in the end of the ribbons until they were too large to pass through the holes and I strung the trains car to car with a few beads in between. My son loved adding the beads with a little help from mom. Total concentration. Tongue pushed into bottom lip, drool about to form. 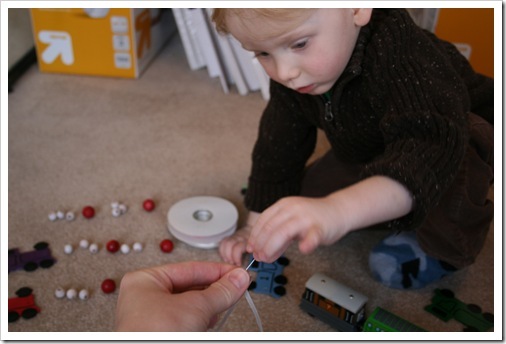 Nothing could stop his nimble fingers from pressing those beads into place, nothing…well maybe playing with some toy trains…but! that was the only thing! 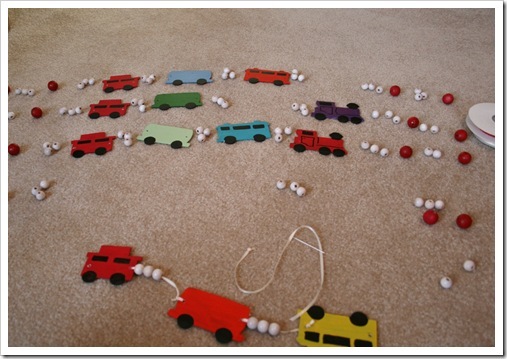 After linking up the trains we hooked them to each other in one long garland with the rest of the beads strung in between. 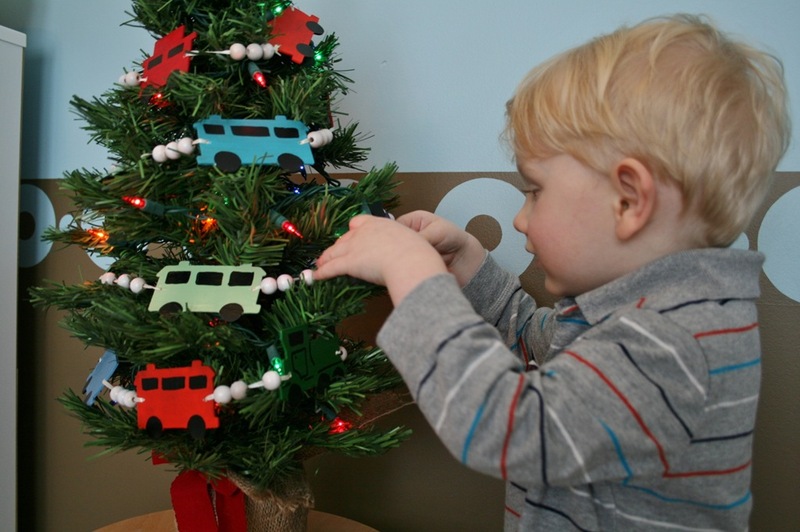 I thought they looped around his tiny tree pretty well. He loves pointing out the one odd ball engine, which he insisted we paint dark purple. And, of course the number 1 engine, “Thomas”, has a special spot at the top. 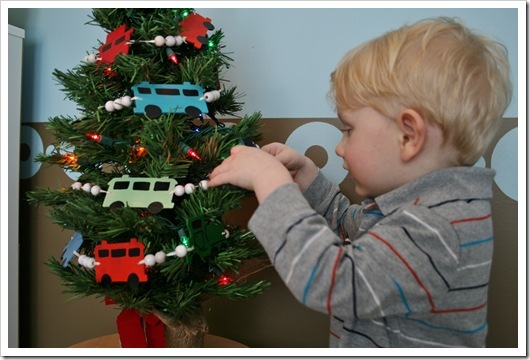 Have you guys put together any special trees for your little ones? 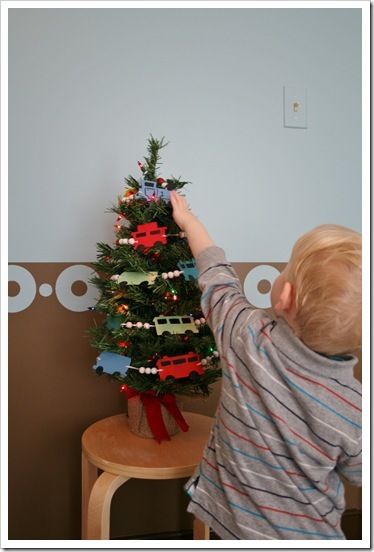 Do you put up any other decorations with your kids or with your kids in mind? Oh my! The little train garland is adorable!